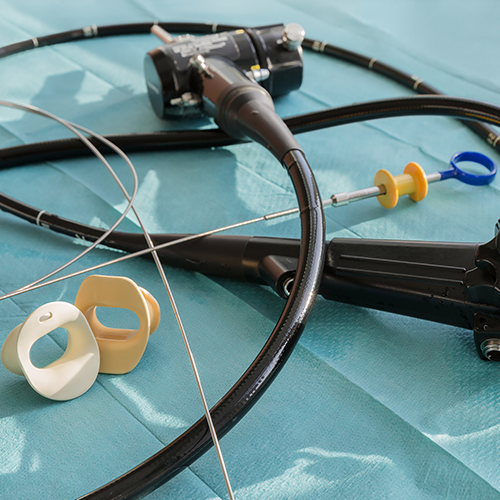 Background: Process challenge devices (PCDs) according to Annex 9 of the Guideline are used for the process control of the overall reprocessing efficacy for thermolabile endoscopes. The analysis of these PCDs is sophisticated and requires a microbiological laboratory. These PCDs are therefore not appropriate for routine controls in central sterile departments. Material and methods: Within a research project, a PCD system was developed that is simple and fast to use for the routine control of the overall process efficacy of processes that rely on glutaraldehyde as isinfectant. The system is based on special enzymes immobilized on a fibrin matrix in tubeshaped devices. The enzymes selected act as surrogates for the conventional test organisms (Enterococcus faecium), as the enzymes are equivalently denatured by process-typical temperatures and concentrations of the disinfectant. Results: Comparative investigations in the laboratory as well as in hospitals demonstrated the good match of results between the new enzymatic test system and PCDs according to Annex 9. Read more in Steri-World Issue 01/2018.